Scratch (more) words. Make (more) art. This is how it goes: You crack open a door to discovery and find an even larger room aglow with delights. 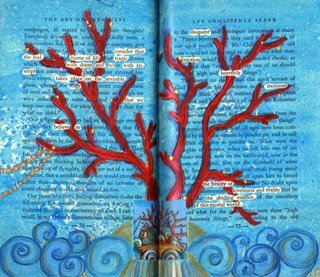 And so, in my fascination for altered books, I found Karen Hatzigeorgiou, an artist creating contemporary art in the form of altered books and collage. To say her work is stunning is an understatement. It’s a wonderful balance of color and meaning, image and substance. I could sing her praises for paragraphs but I will direct you to the real thing instead: http://karenswhimsy.com. I am especially inspired by The Art of Happiness. In the poet/artist’s hand, the 1935 book, of the same title, became a tool for emotional exploration. The result is a work-in-progress journal of touching color, collage and ‘found poetry.' (Page 18 is shown above).